This quote was the first cut in our previous video about modeling this 20th-century iconic favorite – solely with the help of ARCHICAD and its versatile Shell Tool. 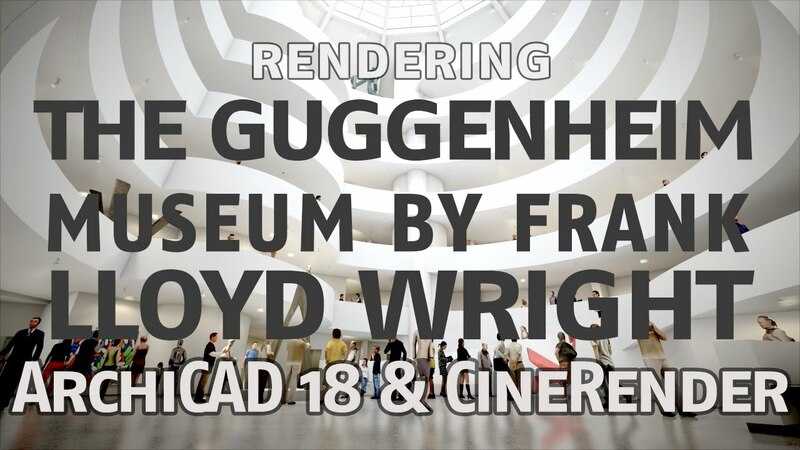 Now, with the integration of Maxon’s CineRender rendering engine into ARCHICAD 18, it is only natural that we feel the urge to further enhance the “space within” to photorealistic perfection! You might be thinking “This interior speaks for itself, rendering it is not a big deal – it’s just white and grey all over!" But in fact, there are several challenges that arise along the way, mostly to do with certain realistic details that can make a render stand out from the average. Not to mention framing this huge interior court, which has given a hard time even to photographers with wide-angle lenses. Let’s walk along the video chronology. First at hand is setting up materials, notably the polished concrete floor. Mr. Wright cooked up a beautiful pattern of circles embedded in a grey polished concrete surface, which has a glossy reflective shine, but also contains visible grains underneath. To accomplish a good looking material, we turn to our color, bump and reflection channels. The color channel is made up of two layers: a pre-made image with the circular motif, and overall procedural noise. Notice that the circular motif has randomly dark and bright circle fills. This will come in handy whenever used. In this instance, for example, the motif is set to “Darken” blending mode, so it gives the color a bit of variation along the way, and drawing our circles at the same time. The reflection channel houses a subsurface scattering shader with a noise surface to catch reflections beneath the surface on some of those pebble grains in the concrete. The Bump channel is made of three different layers. A bottom micro-noise layer serves as the base, which enables the reflection to be blurry. This increases render time, but is necessary for our final blurry surface. We use a bit of our circular motif again in our next layer in multiply mode. This will give the circles in the floor a bit of variation in height, and also bevel the circle contours, since dark means leave in place, bright means extrude in the bump channel. We also incorporate another, very spread-out large-scale noise to realise the waviness of the surface, due to irregularities in construction. After completing the floor and choosing a standard shiny white plaster wall material for the walls, we are ready to undertake a pre-render. The easiest way to do that is to select a pre-set indoor scene and shoot! Next up is the glass roof. In reality, this glass is not see-through, but frosted glass, so the incoming light rays are fairly diffused. Let’s keep it simple this time: select a pre-made glass material from the catalog. Adding lights: Thanks to the concentric spiral form of the building, adding multiple instances of ARCHICAD 18 Spotlamps is a matter of 3 clicks. The triangle light with a luminous material is a Wright design that was saved as an Object and then multiplied. After setting up the scene with furniture, low-poly people (downloaded from BIMcomponents.com) and exhibited material, a Sun object was added to show some direct light streaks on the spiral wall and give a little depth and warm lux to the scene. An HDR image was also used - even though not visible - because it also lends realistic light balance to our scene. Using Global Illumination with QMC and Irradiance Caching gives a good balance between quality and render times. The detailed density and quality settings are on 'high' for these, as well as the Physical Camera settings. That about wraps it up and we are ready to go render! The animations in the video are all fly-throughs created with several cameras. If you need help using ARCHICADs CineRender or other features, be sure to check out the GRAPHISOFT Help Center.